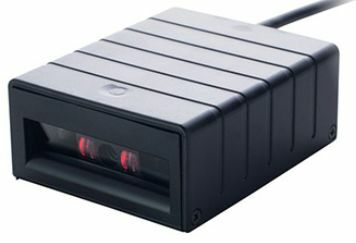 The optical barcode reader is a high performance, omni-directional area imager barcode scanner. It uses digital imaging technology to provide intuitive and fast reading of 1D and 2D barcodes as well as supporting more advanced features like image capture deactivation. Captures barcodes on mobile phone, tablet, or computer screens. Easily integrated with various OEM applications with 1D and 2D barcode scanning. Support various configurable reading modes. Clear aiming spot that makes barcode capture easily. With an optional stand is flexible for external application requirement. Below is the sample diagram on how optical barcode reader can work with terminal.